Installation view (entrance) of “Yasuo Kuniyoshi and Toshi Shimizu: Crossroads of their Lives” at Tochigi Prefectural Museum of Fine Arts. Photo Shinji Saito. Originally, I was not all that interested in modern Japanese Western-style painting (youga). My interest as a critic lay in the relationship between New York simulation art and house music. Despite this, at a certain point in the 21st century I suddenly found myself taking an interest in Kuniyoshi and Shimizu. Around the time of the Great Hanshin-Awaji Earthquake, I started having doubts about my own criticism and Japanese art history itself, and as a result of my research into the post-war avant-garde, I came to realize that war paintings lay at the heart of this. It was also through war paintings that I became interested in Shimizu, a painter from Tochigi. From watching the documentary Samayoeru sensoga (War painting adrift) on NHK in 2003, I learned that Shimizu left behind some peculiar “posthumous works” in the form of his portraits of Ikuo Shimizu. Eager to find out what kind of works these were, I checked the catalogs from past retrospectives of Shimizu’s work at Tochigi Prefectural Museum of Fine Arts, but couldn’t find anything. It was in 2015 while editing Sensoga to Nippon (War paintings and Japan, Kodansha) – the record of a dialogue between myself and Makoto Aida – that I learned that these paintings by Shimizu were held not at Tochigi Prefectural Museum of Fine Arts but at the Okawa Museum of Art in Kiryu in the neighboring prefecture of Gunma. After visiting the museum in Kiryu and speaking with a curator there I was finally able to see the actual paintings. The curator said that they also thought long and hard about whether the portraits of Ikuo Shimizu should be put on display. Toshi Shimizu – Portrait of Ikuo (1945), oil on board. Collection Okawa Museum of Art. So what kind of paintings are they? Well, they’re just like portraits of the deceased. Ikuo was the name of Shimizu’s only son. 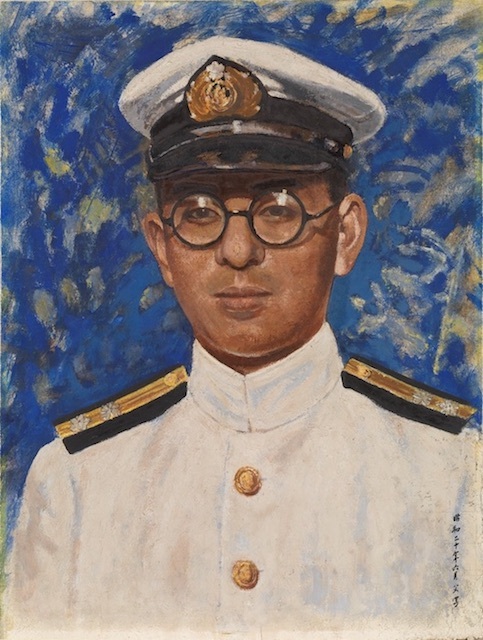 He died in the Pacific War, and after receiving notification of this, Shimizu began to paint portraits of Ikuo, working from morning till night as if he was a changed man. In spare moments he visited a nearby cemetery, but not to have a rest. According to his eldest daughter Fumiko, who secretly watched him during these visits, he would beat the ground and cry while shouting, “Ikuo! Ikuo!” So precious was Ikuo to his father. Despite this, Shimizu himself once wanted to become a soldier, and it was only after failing the military recruitment test as a youngster that, disappointed at having this path blocked, he travelled to the US at the age of 20 and taught himself how to paint, developing his own unique style and making his name. Toshi Shimizu – Chinatown, New York at Night (1922), oil on canvas, 91 x 116.7 cm. Collection Tochigi Prefectural Museum of Fine Arts. 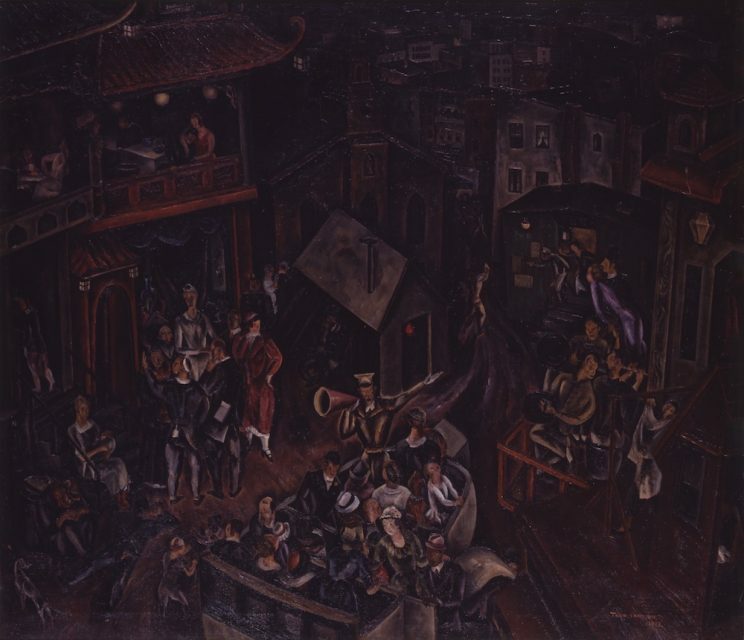 After returning to Japan in 1927 at the age of 40, Shimizu headed to the overseas territories on his own initiative, depicting in paintings such things as the site of the Shanghai Incident. This was before the establishment of the war painter system. 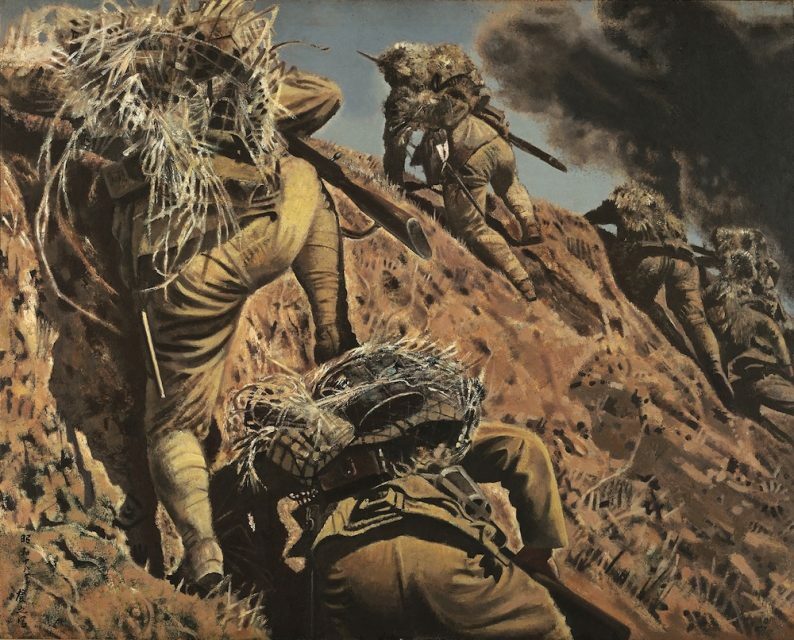 In other words, Shimizu was one of the very first Japanese artists of that era to depict war. In later paintings he even included Ikuo as a soldier holding a gun at the ready on the front line. His dearest Ikuo went on to die in the war depicted in these paintings. In normal circumstances, because he gave his life for his country, his son would have been applauded. But Shimizu did not feel that way. Ashamed of his earlier desire to become a soldier, he was undoubtedly deeply sorry for supporting the war as a propaganda artist. Shimizu died soon after the war ended. According to the records, the cause of death was “leukemia brought about by extreme mental exhaustion,” and one can certainly get a glimpse of this anguish. According to the documentary mentioned above, his final words were, “I’ve had enough of war,” followed by, “Still, I wanted to carry on painting.” He drew his last breath just a few minutes later. Toshi Shimizu – Charge (1943), oil on canvas, 130.5 x 162.2 cm. Collection Tochigi Prefectural Museum of Fine Arts. Now, I am thinking about the staggering gulf between the statements “I’ve had enough of war” and “Still, I wanted to carry on painting.” Within it lies something like the fate artists endure. Or perhaps it would be better to call it a chronic disease or calling. The gulf between these two statements is, to put it another way, the gulf between the statements “Even if they’re war paintings, they’re all that I can paint so I want to paint them regardless” and “Even if I could paint them, if they’re the kind of painting that leads to the loss of my son, I don’t want to paint them.” However, that Shimizu indicated after making the statement “I’ve had enough of war” that “Even so, I want to carry on painting” is of great significance. If he had added “I’ve had enough of war” after saying “I still want to paint,” the effect would be completely different. Shimizu was until the very end a “painter.” If, even after losing the war and losing his son, a course of action remained whereby he could continue painting, it was probably only painting portraits of Ikuo, a victim of the war. Installation view of four portraits of Ikuo by Toshi Shimizu at “Yasuo Kuniyoshi and Toshi Shimizu: Crossroads of their Lives,” Tochigi Prefectural Museum of Fine Arts. Photo Shinji Saito. 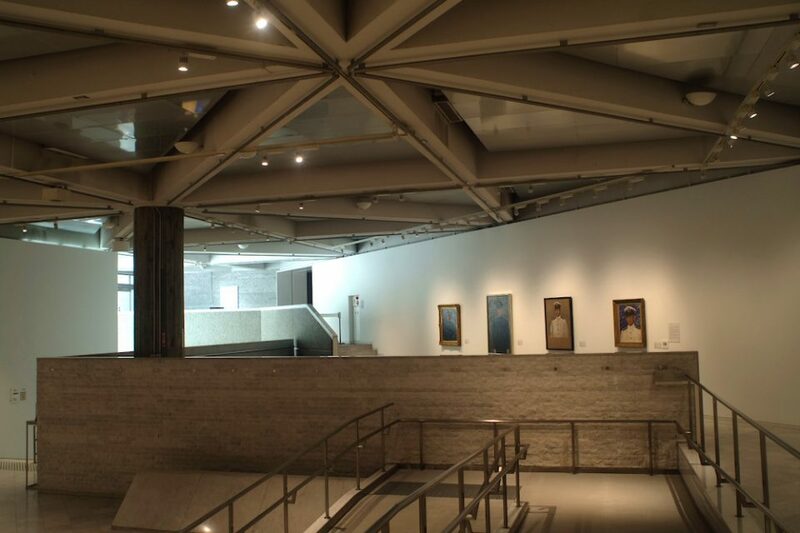 At the Tochigi Prefectural Museum of Fine Arts exhibition, four of the surviving portraits of Ikuo were displayed on a wall near the venue exit. This was a first. According to Sugimura, during one of his visits to the Okawa Museum of Art to study Shimizu’s diaries in the lead up to an earlier Shimizu retrospective, the museum’s director, Eiji Okawa, asked him, “Aren’t you going to include the Ikuo portraits?” Sugimura took a negative view of including these among Shimizu’s painterly works, but when he communicated this to Okawa, expecting to be met with opposition, the director, who was a member of a Special Attack Unit during the war, surprised him by accepting Sugimura’s position without question. Having seen the actual works, based on the record of his son’s life written on the back and the fact that they were displayed for a long time in front of the family Buddhist altar, it is clear to me that the paintings were produced to console Ikuo’s spirit, and I quickly understood that they would not be at home in the modern, clean, room-like environment of an art museum. If anything, I thought they belonged in the category of outsider art. At the same time, however, if there had not been a war, these paintings would never have been produced. In this sense, it would not be wrong to call them “war paintings” in the broad sense of the term. In fact, perhaps paintings like these that have been hidden away are war paintings in a true meaning, a meaning different from the war documentary paintings commissioned by the military. Having come to this opinion, I have remained interested in the portraits of Ikuo even since. And so I thought that being able to re-encounter all the remaining portraits at an art museum in this way would be like closing a certain chapter. However, this was not the case. To deviate from the main subject slightly, the Chinese character for “Iku” in the name “Ikuo” was apparently chosen because it is one of the characters used to write “New York.” But why did Shimizu, who wanted to become a soldier, name his son after New York? I am reminded of how a diary from 1945 that was found in Shimizu’s house in the course of the research for the above-mentioned documentary includes a description of a dream Shimizu had one night in which Ikuo appeared shouting “Papa! Mama!” moments before passing away. But why would he use the loanwords [then banned as the language of the enemy] “Papa” or “Mama” in the middle of the war? The answer is none other that, like the other subject of this exhibition, Yasuo Kuniyoshi, Shimizu traveled to the US as a young man and announced himself as an artist there. For Shimizu, America was a new world. In the minds of those who chose to head to the US at a time when members of the painting elite who graduated from the Tokyo School of Fine Arts were heading one after another to the home of painting in Paris, there was probably a yearning for the American Dream of one day triumphing over a former adversary. This was after the Russo-Japanese War when the Yellow Peril raged, but even though he was openly discriminated against and even had prizes withdrawn from him because he was Japanese, this did not change the fact that it was not the Japanese art world but America, the land of freedom, and its epicenter, New York, that nurtured Shimizu’s painting. No doubt these feelings were behind the decision to name his son Ikuo. What thoughts, then, would have passed through his mind when he returned to Japan and war broke out? Japan was now seeking to surpass the US, a country to which Shimizu was indebted but where he had experienced discrimination. In this sense, perhaps the Ikuo that appeared in Shimizu’s battlefield paintings carried Shimizu’s own personal feelings that Ikuo was trying to surpass America in the name of Japan. If so, then perhaps the Ikuo portraits, painted after both of these dreams had been dashed, cannot be dismissed purely as attempts to console Ikuo’s spirit. 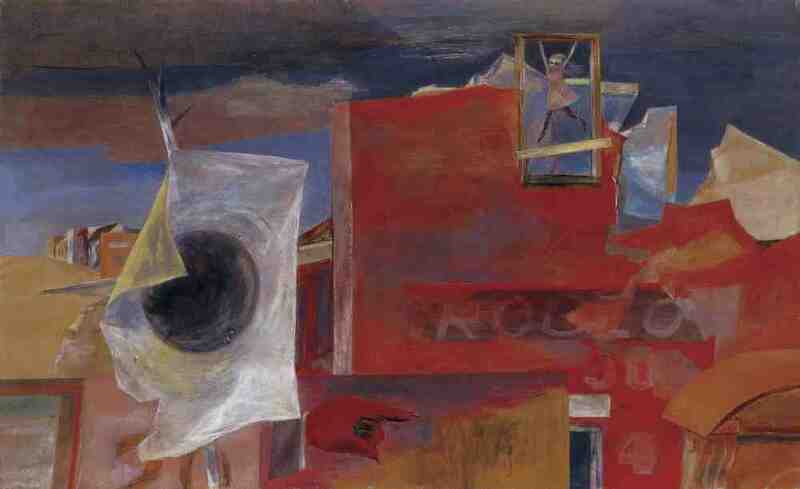 Yasuo Kuniyoshi – This is My Playground (1947), oil on canvas, 68.6 x 111.8 cm. The Fukutake Collection. In order to further pursue these difficult questions, it is not enough to consider the situation with respect to war paintings in Japan alone. In contrast to Shimizu, the other subject of this exhibition, Yasuo Kuniyoshi, stayed on in the US, and, after becoming an “enemy alien” cooperated with America’s war effort by becoming a propaganda artist. After the war he became the first living artist to hold a solo exhibition at the Whitney Museum of American Art in New York, which was built to showcase American art, and four years later he was selected to represent the US at the 1952 Venice Biennale alongside Alexander Calder, Edward Hopper and Stuart Davis. By a strange coincidence, this was also the year that the Treaty of San Francisco came into force, ending the occupation of Japan and enabling the country to rejoin the community of nations. In this year that was so significant for post-war Japan, Kuniyoshi reached his peak as an American painter while remaining a Japanese citizen. If the Japanese artist who achieved the greatest success in the School of Paris era was Léonard Tsuguharu Foujita, who died 50 years ago this year, the Japanese artist who attained the greatest fame in post-war America in the 1950s was Yasuo Kuniyoshi. After the war, Foujita was condemned by his fellow artists on the grounds that he cooperated as a war artist with the Japanese war effort, and left Japan. He became a French citizen, renouncing his Japanese citizenship, and converted to Catholicism. He never returned to Japan. Similarly, Kuniyoshi applied for US citizenship, but he died of illness in 1953 before it was granted. He was 63 years and eight months old. Certainly, Kuniyoshi’s works have gained such popularity that anyone would have a vague idea of what they look like. However, the full picture of his achievements as a painter is still veiled in many mysteries. “Yasuo Kuniyoshi and Toshi Shimizu: Crossroads of their Lives” was held from April 28 to June 17, 2018, at Tochigi Prefectural Museum of Fine Arts. 1. 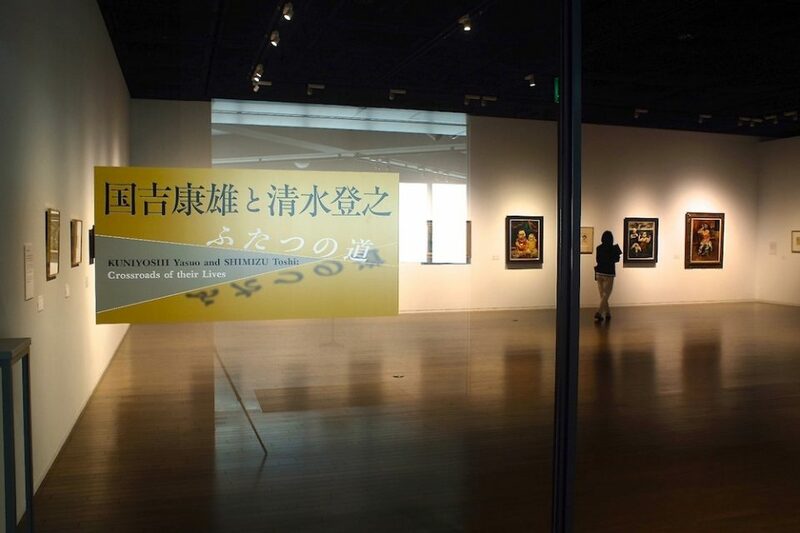 “Motherland / Japan / Enemy Nation” a three-person discussion held on June 9 in conjunction with the exhibition “Yasuo Kuniyoshi and Toshi Shimizu: Crossroads of their Lives” at Tochigi Prefectural Museum of Fine Arts. “Yasuo Kuniyoshi and Toshi Shimizu: Crossroads of their Lives” viewing guide, Tochigi Prefectural Museum of Fine Arts, 2018. Toshi Shimizu, exhibition catalogue, Tochigi Prefectural Museum of Fine Arts, 2007. Toshi Shimizu, exhibition catalogue, Tochigi Prefectural Museum of Fine Arts, 1996. Do you know Yasuo Kuniyoshi?, The Yasuo Kuniyoshi Handbook Production Project, Okayama University, 2017.